(Newser) – The world's deadliest cat is no leopard or tiger—in fact, it's the size of a house cat and appears just as cuddly. 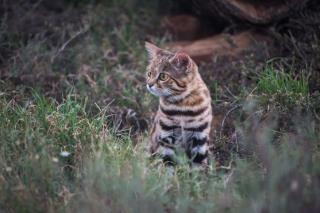 But the black-footed cat of southern Africa can hunt the grasslands like no other, Live Science reports. The PBS series Super Cats follows them on nightly forays, showing how they hunt and explaining why they kill more prey in a night than a leopard does in half a year. German zoo curator Luke Hunter helped by fitting several black-footed cats with radio collars, enabling the crew to track them in tall grasses. "If you're a gazelle or a wildebeest, a black-footed cat isn't at all deadly," says Hunter, who has studied the cats since the 1990s. "But those success rates make them the deadliest little cat on Earth." Worlds Deadliest Reporter = Neal Colgrass There are other more Pressing Environmental Issues to report, for example how some Western Countries are dumping Plastic Waste onto Asian Countries b/c of a lack of respect, which then end up being Openly Burned near Housing Areas, instead of these Countries using their 'superior technology' to process their own waste. . I wonder how much of these Newser reports are Original content (like REAL Journalists do), instead of being Copied & Pasted from other Internet Articles? . Like the Killer Rabbit. Run away! Run away!